OLIMP Gladiator is a phenomenal snack for athletes and people who care about their figure. It is available in the form of a classic bar, covered with a layer of crunchy chocolate. It successfully replaces unhealthy sweets available on the market. It provides a great amount of protein, contains important for health fiber and safe sweeteners. Irresistible taste and unquestionable consistency are the features that distinguish the presented bar from others that are available on the market. At the same time, these are the aspects most consumers pay attention to. While most of the protein bars have a sticky and rubbery consistency, the crunch bar Gladiator enchants with delicacy. Its taste and flavour are enhanced by a layer of real chocolate. A solid portion of protein should be included in the daily menu of each person. It should also be remembered that physically active people show a greater need for proteins. The presented bar contains 36% of protein and few carbohydrates. What is important, there is also a place for fiber in it. Specialists estimate that the average person consumes it too little. Meanwhile, fiber is very important for health - it improves the intestinal peristalsis and increases the feeling of satiety. Safe for health sweeteners such as maltitol or xylitol give the desired sweet taste and at the same time provide low calories and do no harm. The producer of the presented chocolate bar made use of both. The bar also contains sucralose, which is also undoubtedly safe. Its opposite is controversial aspartame, but fortunately we will not find it in the composition of this product. Small and very satiating bar easily fits in your pocket and can be taken with you on a training, to school, work or on a trip. It is a quick and comfortable snack, perfect when the hunger strikes. A high-protein bar will be a much better choice than the shop sweets or a fast-food dish, and it will successfully satisfy your appetite. 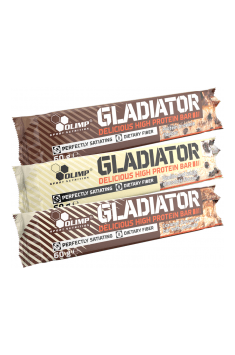 To sum up, OLIMP Gladiator is a delicious candy bar, which easily satisfies hunger and the desire to eat something sweet. Its composition is incomparably better than the composition of an average bar from the store shelf. A big advantage is the high protein content and the use of safe sweeteners instead of sugar. The high-protein bar is a fast and easily available snack, which in exceptional cases can be a substitute for a wholesome meal. It is an ideal solution for physically active people and works great in the role of a pre or post workout snack. It will pass the exam during the long breaks between meals at school, work or during a travel. In addition, it is a good alternative to sweets - it is recommended to people who care about the figure or are on a reduction diet. It is worth remembering that the bar contains sweeteners that, if eaten in large quantities, can cause a laxative effect. 23,3% chocolate topping with sweetener (cocoa mass, sweetener - maltitole, cocoa butter, milk fat, emulsifier - lecithin (from soy), natural vanilla flavor), 19.5% milk protein, 18.3% layer caramel flavor (filling substance - polydextrose, vegetable oil (soybean), skimmed milk powder, sweetener - xylitol, emulsifier - lecithin (from soy), salt, aromas), hydrolyzed wheat gluten, humectant - glycerol; 5.0% soy crunchy (soy protein, reduced fat cocoa, tapioca starch), 2.8% soy crunchy (soy protein), vegetable oil (soy), crushed and roasted cocoa beans, aromas, salt, sweetener - sucralose. 23,3% milk chocolate topping with sweetener (sweetener - maltitole, cocoa butter, whole milk powder, cocoa mass, emulsifier - lecithins (from soy), flavors); 19.5% milk protein, 18.3% caramel flavor layer (filling substance - polydextrose, vegetable oil (soy), skimmed milk powder, sweetener - xylitol, emulsifier - lecithin (from soy), salt, aromas), hydrolyzed wheat gluten, humectant - glycerol; 7% soy crunchy (soy protein), vegetable oil (soy), 0.7% ground peanut (peanut), cocoa mass, aromas (contain milk and peanuts), salt, sweetener - sucralose. 23,3% white chocolate topping with sweetener (sweetener - maltitole, cocoa butter, whole milk powder, emulsifier - lecithin (from soy), 0.02% natural vanilla flavor) 19.5% milk protein, 18, 3% vanilla layer (filling substance - polydextrose, vegetable oil (soy), skimmed milk powder, sweetener - xylitol, aromas, salt, emulsifier - E472 c, dye - E 171), hydrolyzed wheat gluten, humectant - glycerol; 7.6% soy crunchy (soy protein, reduced fat cocoa, tapioca starch), vegetable oil (soy), 0.7% cream powder (contains milk), aromas (contain milk), salt, vegetable oil ( sunflower), sweetener - sucralose; dye - carotenes. *The stated nutritional values ​​may vary depending on the selected flavor version of the product. **Allergens are marked in bold.